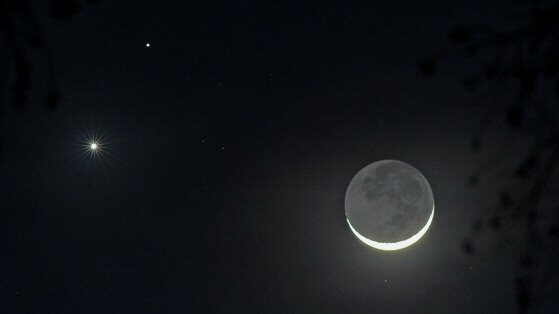 An Amazing Summer Solstice Event A sparkling triangle of Venus, Jupiter, and the crescent Moon will grace our night sky this Saturday June 20th. This spectacular conjunction will be visible from the later dusk hours to the first hours of full darkness. For Pagans, this is an extra special event, because it coincides with our Summer Solstice celebration. The Solstice is a celebration of change from the waxing to the waning year. There are several symbols to represent the holiday. The Holly and Oak Kings, the Sun represented in the bonfire, the messengers of the Sun represented in the Ravens/Crows and even the Garden and Water Fae. Add to those symbols of the Solstice holiday the energy of this triple conjunction. Three is an important number to Pagans in the representation of Mind, Body, Spirit as well as the Triple Goddess (Maiden, Mother, Crone), the cycle of life in Birth, Life, Death. Even the flow of energy in being the Novice, Experience to attaining Wisdom. Each representing the totality of spirit, the flow of energy from one to the other and back again. Then there’s the energy of the ‘planets’ themselves. In the popular astrological Zodiac each one of these celestial bodies have their own energies and govern certain characteristics in our lives. Venus as the Goddess of Love and Money. She is all about pleasure, especially pleasure shared with someone else. She concerns herself with love, romance and harmony in our emotional attachments. Jupiter, the King of the Gods, is the ruler of Sagittarius, the planet of plenty. He is tolerant and expansive, as well as one of the first social planets. The Moon is the ruler of the tides, so it is fitting that the Moon should be the ruler of our emotions. Which also makes her fitting to GrandMother Moon who watches over her child, Mother Earth. Putting all this together, adds to the Solstice of change. Fitting that the Solstice is also associated with the Raven/Crow messengers. and these three ‘planets’ are social in nature. Each representing emotions, partnerships and family. Situations all representing the need for communication and listening to messages from spirit to the physical world, and back again. You can’t have a healthy relationship without two-way communication. Concentrating on partnerships and communication are great ways to add to your Solstice celebrations. Acknowledging the Goddess in harmony with the Kings as the Gods of the year can balance the energy of male/female and is another representation of partnerships in all their forms. Lovers, parents to child, even in business. And since each planet also touches on abundance and prosperity, this might even be a good time for rituals that touch on those energies in your life as well. You can add symbols of each planet to your altar as well. A heart for Venus, as crown for Jupiter, a white ball for the Moon for examples. You can draw pictures of their Astrological symbols on paper and write a message to the fae asking for help with a special wish or an area in your life that needs some love and abundance. Think about what each aspect of the holiday represents, along with the characteristics of each ‘planet’. Then use that knowledge as inspiration for your own ideas to incorporate these events in celebration. Remember there is no right or wrong way to honor the holidays. There’s your way and what works for you. Trust your instincts, feel connected to what you choose and respect all things with love and humility. You’ll do fine and create a great ritual too.